Clarins Delicious Self Tanning Cream. It looks a bit like whipped chocolate pudding. And even smells a bit like cocoa - probably because this self tanning cream is made with cocoa, the richest part of cocoa butter. 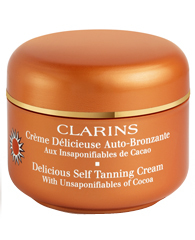 Clarins Delicious Self Tanning Cream smells good enough to eat - but I caution you not to (eat it, that is). I urge you to spread this luxurious cream over your body - wherever you want a deep rich, glorious golden tan. This beauty is perfect for the legs. My legs are finally looking how I like them to look faux-tanned. This delicious cream moisturizes as it glides across your skin, while leaving it super soft. The instant color is gorgeous too, one that you can apply and then go out of the house with - after waiting about ten minutes for it to completely dry, that is. I so love the fact that I only need to re-apply this cream every week - five days if I really want to amp it up. Of course, the darker you want to go, you could apply as often as you wish - but it is not necessary. Really, this self tanner lasts, and fades very naturally. No one will ever know that you go faux! Check this out at your Clarins counter, and stock up. I will be, as this has now moved others out of it's way to become a mainstay on my self-tanner shelf.